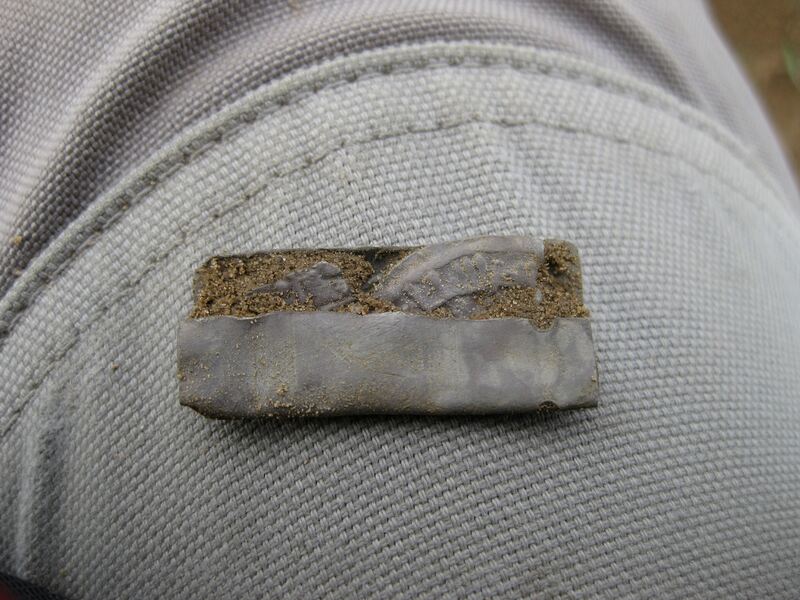 Archaeologists at Historic Jamestown have discovered the tenth Virginia-made pipe with a name inscribed on the stem. 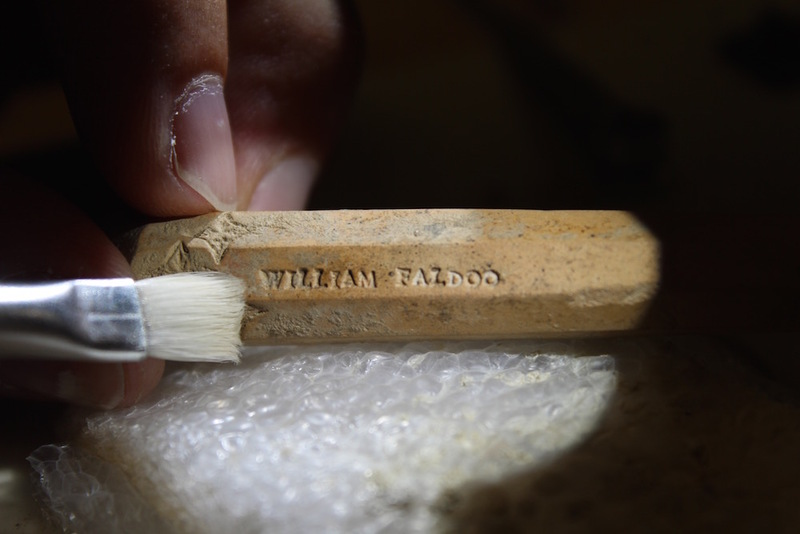 It’s the first new named pipe found at the site since 2009, and in contrast to most of the earlier discoveries, the name is complete: William Faldo. The stockholders of the Virginia Company were expecting to make a quick profit from their investment in the Jamestown settlement, but the struggling colonists could barely keep themselves alive, never mind send back the riches in minerals and trade goods the company had envisioned. They weren’t even self-sufficient, having clashed with the Powhatan tribes weeks after their arrival and being saddled with a surfeit of soft-handed gentlemen rather than farmers and laborers who could have been of practical use. In January of 1608, eight months after the founding of Jamestown, the Virginia Company sent a supply mission that was woefully short of necessary provisions but long on new colonists. At least this time there were more laborers and tradesmen than gentlemen on board. Pipemaker Robert Cotton was one of them. Tobacco was introduced to Europe by the Spanish in the 16th century but it was Sir Walter Raleigh who popularized it in England after Ralph Lane, first governor of Virginia, gave him a long-stemmed pipe and Virginia tobacco in 1586. By the time John Rolfe, future husband of Pocahontas, planted Virginia’s first commercial tobacco crop in Jamestown in 1612, smoking was widespread in England. Rolfe’s first crop was sold in London in 1614. Five years later, Jamestown was exporting 10 tons of tobacco to England a year. By 1639 it was 750 tons. When Robert Cotton first arrived at Jamestown, there was no tobacco cash crop. 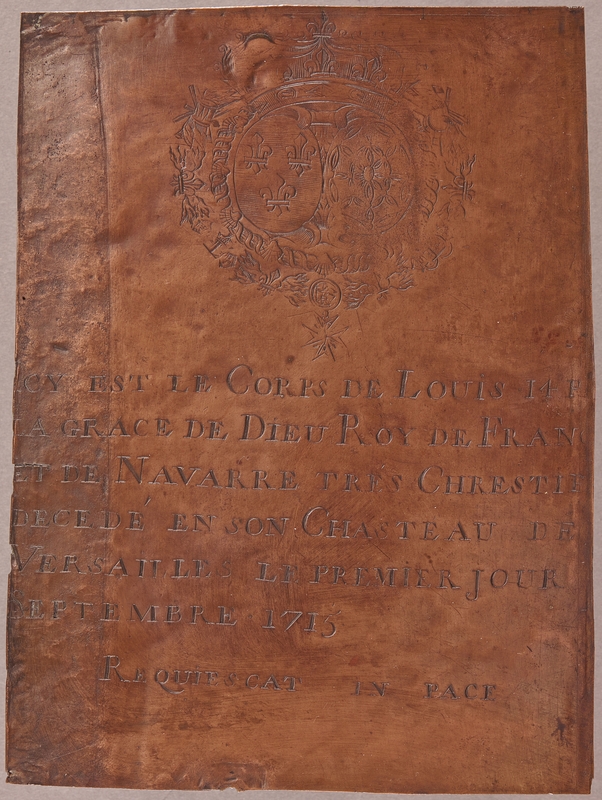 His brief was to seek out new sources of clay and pipe production methods that would give the Virginia Company consumer goods they could actually make some money selling in England. The London pipemaking industry was supplied exclusively by Dorset white clay. If Virginia clay could supply a colonial pipemaking enterprise, the Virginia Company could break the Dorset monopoly. While there are no surviving documents mentioning Robert Cotton other than the passenger list of the First Supply mission, archaeological evidence of his work has survived. 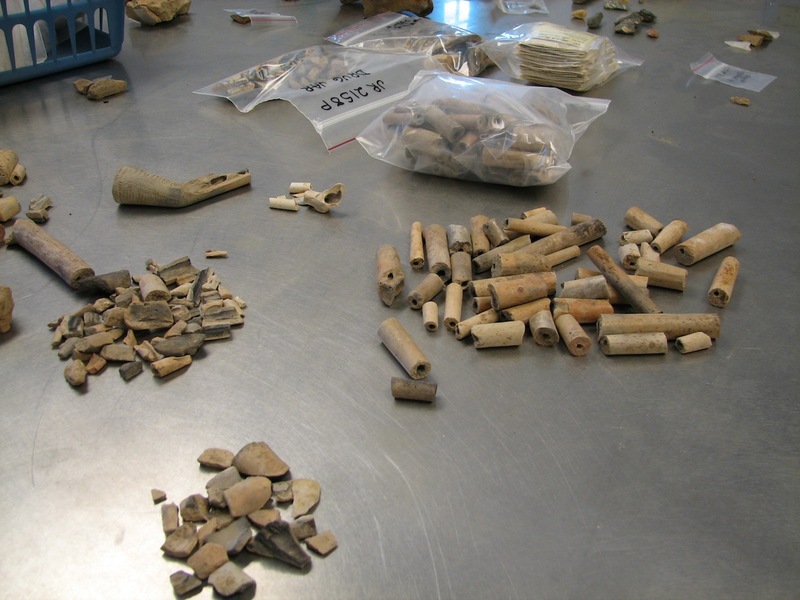 Since 2006, archaeologists have unearthed more than 1,550 fragments of pipes made by Robert Cotton. They were found in a well, probably discards that failed during the manufacturing process. Cotton combined the tulip-shaped bowl of Virginia Indian pipes with English technology and decorative elements to create a unique design not found in any other early Virginia colonies. The Virginia clay wasn’t the pristine white of Dorset’s or fired at the same high heat, but Cotton’s handmade work (he did not use molds to make these pipes) was appealing and saleable. Many were stamped with a diamond shape maker’s mark and fleurs-de-lis. A few of them were inscribed with the names of influential people stamped into the clay with printer’s type. Nine pipes were found with names or enough of a name to be identifiable, all of them officials of the Virginia Company or high-powered courtiers: Sir Charles Howard, lord high admiral of the English Navy, famed explorer and smoking trend-setter Sir Walter Raleigh, the Earl of Southampton, Virginia Company official and patron of Shakespeare whose name appears on two pipes, Lord De La Warr, owner of a huge quantity of Virginia Company stock and first resident governor of Virginia, Captain Samuel Argall, ship’s captain and lieutenant governor of Virginia, Captain Francis Nelson, ship’s captain of the Second Supply mission, Sir Walter Cope, antiquarian and Virginia Company official, Robert Cecil, Lord Salisbury, Virginia Company investor and King James’ secretary of state. It’s unlikely these luminaries commissioned a Virginia pipe. Archaeologists believe the name stamping was a marketing device, a gift for investors to assuage their concerns attending Jamestown’s financial prospects. William Faldo, however, was not so illustrious a personage. He may have gotten his own named pipe because he was friends with the maker. His pipe was also found in a different location, a cellar rather than a well. Faldo was a Swiss German member of the Society of Mines Royal who persuaded the Virginia Company that he could find silver mines in the colony. He arrived along with a group of German and Polish craftsmen in October of 1608 and quickly set out to find the mines. He was believed to have found a silver mine upstream of the falls of the James River, but before thoroughly exploring it he went back to England to secure an exclusive contract to work the mine. He returned with Governor De La Warr in 1610 after the Starving Time had driven the few survivors to abandon the Jamestown fort. De La Warr was very keen on securing that silver, so he ordered the settlers to stay put and rebuild Jamestown. The silver was never found and Faldo was killed by Appomattox Indians that same year. 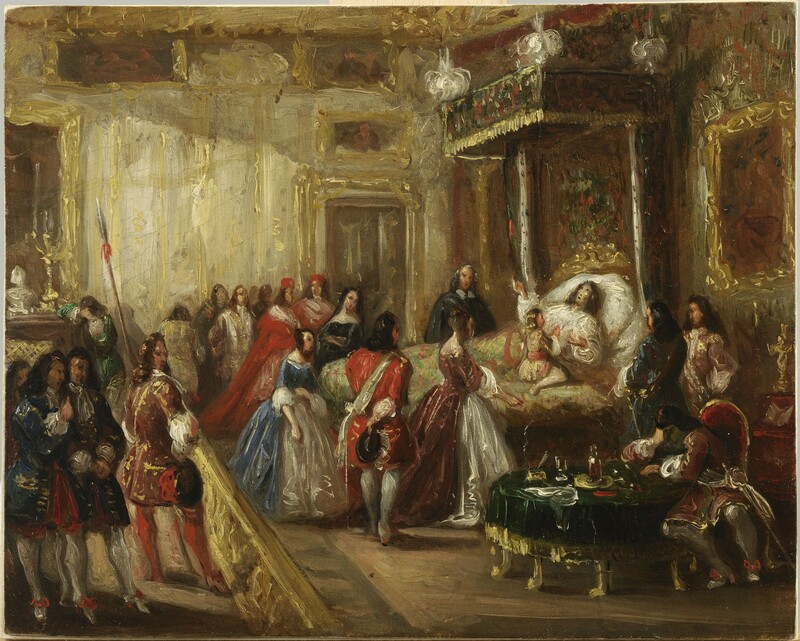 The long, drawn-out, painful death of King Louis XIV of France was thoroughly documented and published in the memoirs of some of the men who witnessed it. It was so slow that the king himself took the opportunity to plan it out thoroughly, concerned about the state of his soul and the future of his realm which he had so materially damaged with endless warfare and extravagant spending. After he finally breathed his last, the elaborate funerary traditions of the monarchy kicked in, and the political ramifications of the succession — Louis outlived his legitimate sons and grandsons leaving his five-year-old great-grandson Louis, Duke of Anjou, as heir to the throne — had to be addressed. The death of any king was of great national and international import; the death of the Sun King more so that most. 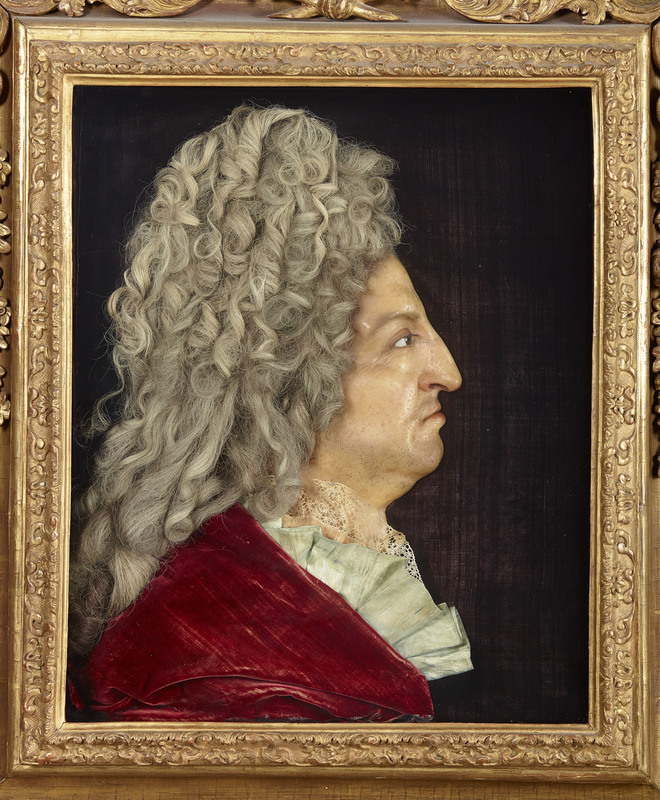 The health of Louis XIV had been in decline for the last year of his life. Rumors abounded in the hothouse environment of the royal court at Versailles that his legs were dangerously swollen. In London wagers were laid on how long he would live. Head physician Guy-Crescent Fagon, who despite having basically bled to death Louis’ beloved grandson, granddaughter-in-law and great-grandson when they were struck with measles still held the full confidence of the king and his secret wife Madame de Maintenon, insisted there was nothing seriously wrong with Louis. The king’s head surgeon was not so complacent, but his appeals to Fagon and Mme de Maintenon went unheeded. On August 11th, 1715, Louis felt a sudden intense pain in his left leg. 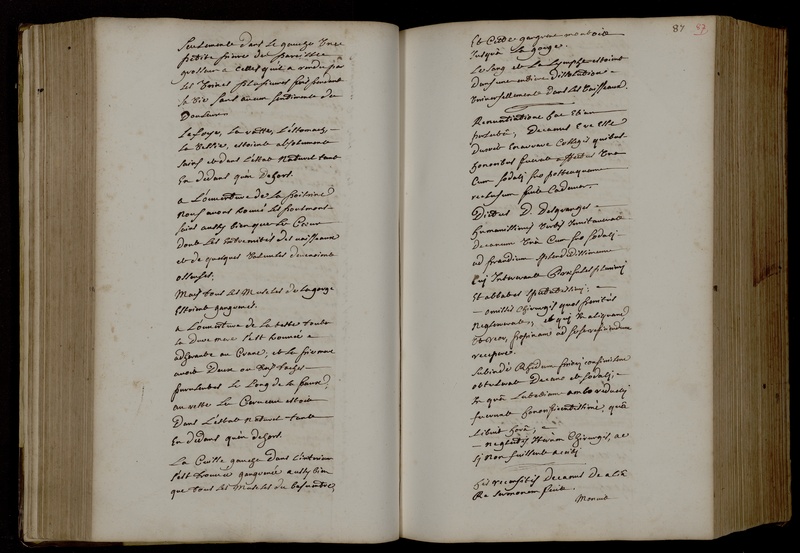 Fagon chalked it up to sciatica and prescribed a purgative, but when the pain increased to the point where he couldn’t even walk the short distance to Mme de Maintenon’s chambers, Fagon was finally persuaded to call in consulting physicians. Mareschal was able to assuage the king’s pain by rubbing the leg with hot cloths, but the relief was temporary. 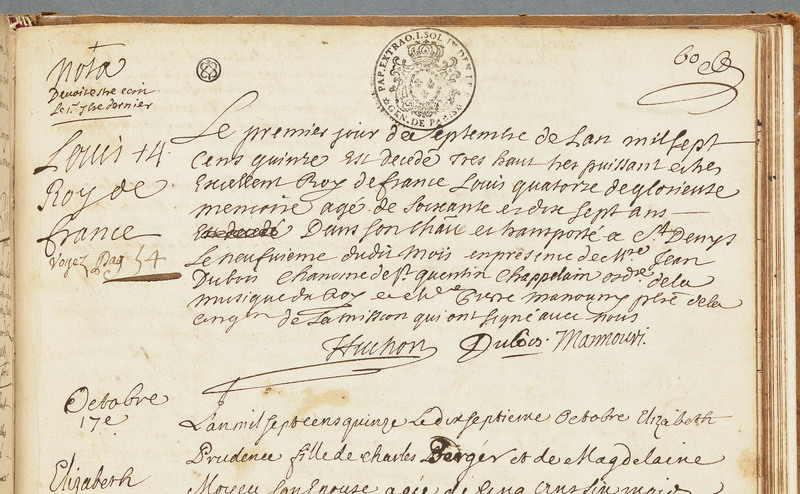 The physicians arrived from Paris on August 14th. They felt the king’s pulse and after much discussion prescribed asses’ milk which they then unprescribed because in the hours they spent yammering the king’s pain had abated. Mareschal continued to massage the leg because it was the only thing that made him feel better even if just for an hour, and on August 17th he saw that a red spot on the leg had developed into a sore. The surgeon now realized the king had gangrene, that only amputation could save his life. Fagon kept his head firmly embedded in the sand. More doctors’ consultations, more asses’ milk, a bath in spiced Burgundy wine and other useless treatments ensued until the leg’s blackened and swollen condition made it impossible for Fagon to deny that this was a surgeon’s issue and Mareschal took the lead. He had a team of consulting surgeons brought in on August 25th. They took one look at the leg and knew it was just a matter of time. It was too late to amputate. Louis himself realized that he wasn’t bouncing back from this one. He asked Mareschal how long he had left to live and the surgeon told him he had maybe two days. The king began to put his affairs in order. He received the last rites from the Cardinal of Rohan, had the entire court pass before his bed to give their last farewells and brought the young dauphin in to give him the benefit of his final counsel. 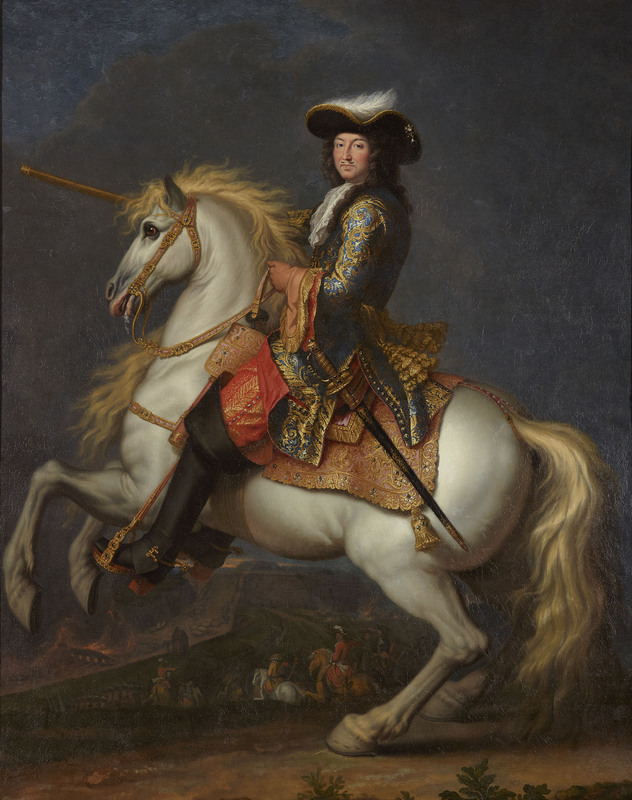 Reportedly Louis XIV told the soon-to-be Louis XV that he had loved war too much, that it was the ruination of the people, that he should not imitate his taste for expensive construction, that he should spend money alleviating the suffering of his people instead. The Sun King died on September 1st, 1715, having reigned 72 years (54 if you subtract the regency) of his 77 years of life. The exterior of the left side was found gangrenous from the extremity of the foot to the top of the head; the skin peeling every where, but less on the right than on the left; the body extremely distended and bloated; the bowels much altered with inflammation, especially those on the left side; the large intestines extraordinarily dilated. The kidneys were fairly normal and natural; but in the left one was found a small stone similar to those the King had several times passed without pain while in health. The liver, spleen and stomach were in a normal condition, both externally and internally. The lungs, as well as the chest, normal; the heart in very good condition, of ordinary size; the terminals of the great vessels ossified. All the muscles of the throat gangrenous. On opening the head, the dura mater was found adherent to the cranium, and the pia mater marked with black areas along the falx; the brain sound, in natural condition, outside and within. The interior of the left thigh, where the King’s disease began was completely gangrenous in every part; all the blood in all the vessels totally disorganized, and very scanty in amount. 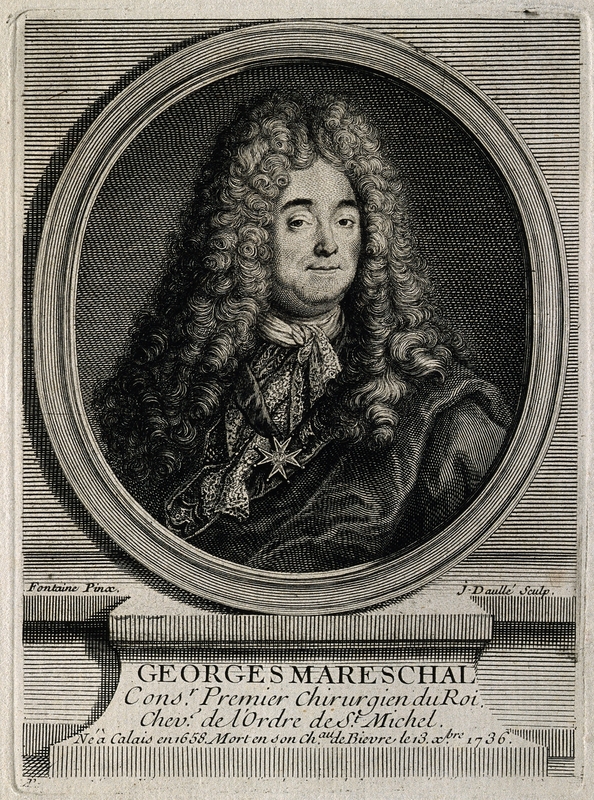 The opening concluded, Mareschal embalmed the body. As per a tradition begun with the death of Capetian monarch Philip the Fair in 1314, Louis’ body was divided in three parts, like ancient France had been under Caesar. His viscera were removed and placed in one reliquary, his heart in another and his body in a double coffin of lead and oak. The coffin was displayed for a week in Versailles’ Mercury Room. It left Versailles for Paris the evening of September 8th, arriving at Saint-Denis at dawn the next morning. The coffin was placed in the Bourbon tomb. The entrails were entombed at Notre-Dame. The heart went to the Church of the Jesuits. The royal tombs and reliquaries of France were desecrated and destroyed during the French Revolution. Louis XIV’s heart was sold to an artist to use in the production of prized glaze called “mummie” made by macerating an embalmed human heart in alcohol and herbs. 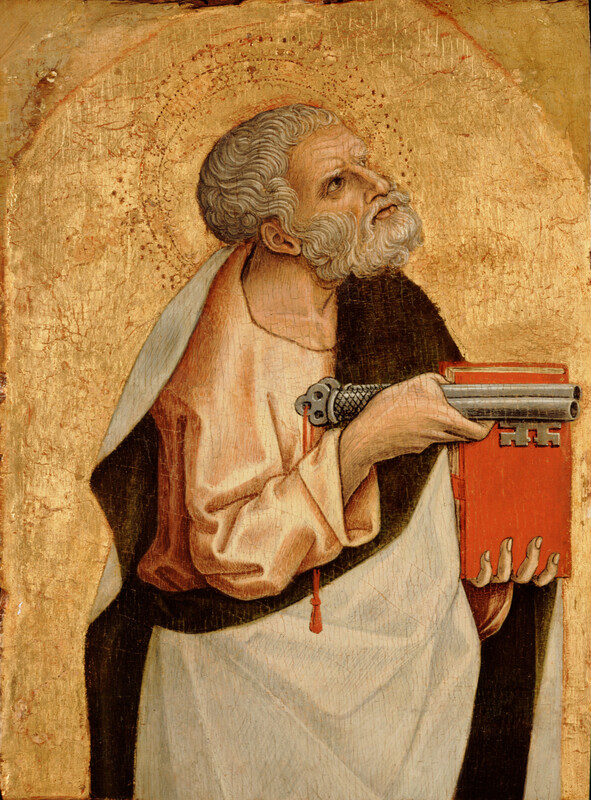 The artist, Saint-Martin, kept a chunk of the heart and returned it to the state after the restoration of the monarchy. In honor of the 300th anniversary of Louis XIV’s death, the Palace of Versailles is putting on an exhibition dedicated to his final days, autopsy, funeral and the continuing significance of the ritual in the context of Revolution and Restoration. The King is Dead is the first exhibition dedicated to the monarch’s death. The exhibition will bring together works of art and historical documents of major importance from the largest French and foreign collections, including ceremonial portraits, funeral statues and effigies, gravestones, the manuscript for the account of the autopsy of the king, coins from the Saint-Denis Treasury, gold medals, emblems and ornaments, and furniture of funeral liturgy. Some of the pieces on display have never been exhibited in public. Exhibiting these masterpieces has required grand scenography effects. Scenographer Pier Luigi Pizzi was asked by Béatrix Saule, the exhibition’s Head Curator, to design the layout for this great Baroque show. Across the nine sections, visitors will discover a veritable funeral opera conducted by the artist. Don’t panic! It’s just The War of the Worlds. 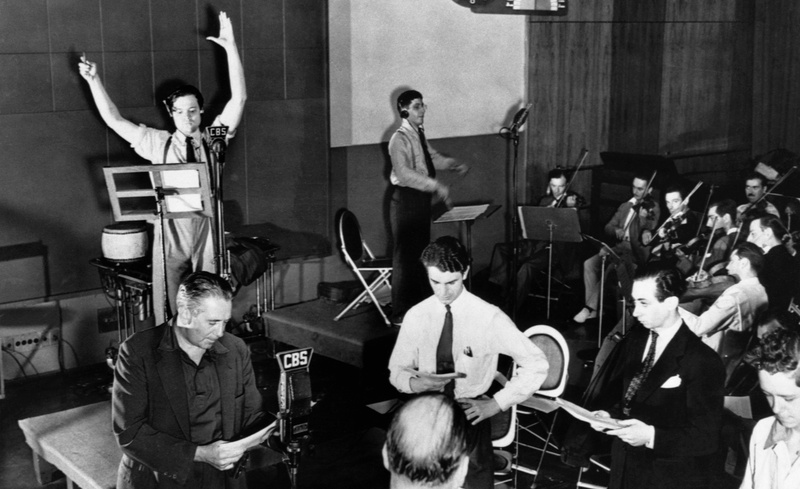 Seventy-seven years ago, Orson Welles’ Mercury Theater broadcast a radio play of H.G. Wells’ alien invasion classic The War of the Worlds. The next day was Halloween and the newspapers dutifully scaremongered, splashing sensationalized headlines on their front pages about the mass hysteria the radio program had provoked in the listening audience. There were reports of suicides, people being hospitalized for shock, heart attacks and thousands of terrified callers clogging the radio station’s phone lines. Almost all of those reports have proven unfounded, although it is true that more people than usual called the station, some complaining about the show being too scary, others complimenting the show for being so scary, still others wanting to know how they could help the victims of Martian violence. One of the frightened listeners sued CBS for “nervous shock”, but the suit was dismissed. One man wrote to CBS claiming he had spent $3.25 of his savings for a bus ticket to flee the Martians and only heard it was play 60 miles later. He was saving up to buy a new pair of shoes, so he asked CBS to send him a pair of black men’s shoes, size 9-B. Welles sent him his new shoes, against the advice of CBS’ lawyer. Orson Welles had already had success on radio in 1937 as the voice of The Shadow and on the stage with his innovative Mercury Theater company when CBS offered him a one-hour anthology series debuting in July 1938. This was prestige listening, adaptations of the great works of literature written and performed by a professional troupe of the New York theater. The introduction emphasized this pedigree, noting it was radio’s “first presentation of a complete theatrical producing company.” Welles and his Mercury Theater cast and crew put on the works of William Shakespeare (Julius Caesar), Alexandre Dumas (The Count of Monte Cristo), Charles Dickens (Pickwick Papers) and Robert Louis Stevenson (Treasure Island), among many others. 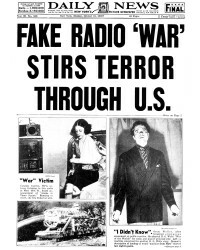 It is true that Welles deliberately set out to give his version of The War of the Worlds a realistic news story staging complete with expert commentary, witness interviews and fake reports from military honchos. It wasn’t a hoax, though; just a way of giving the show a fresh, dynamic immediacy and give the audience a nice little scare for Halloween. Still, CBS was concerned that people might confuse it with real news, so they made sure there were disclaimers not just before the opening of the program, but also at the 40 and 55 minute marks. The show opened with what sounded like standard radio programming — a weather report followed by an orchestra playing music in a hotel ballroom — that was suddenly interrupted by a special new bulletin reporting explosions of hydrogen gas on Mars. Then it was back to the sleepy dance music, then another special bulletin, then back to the orchestra, then another break away to an astronomer describing what he saw on Mars. The tension grew from there as reports got more and more dramatic and the regular programming of music kept getting cut off after a few bars. The other Mercury Theater broadcasts were more traditional radio plays. 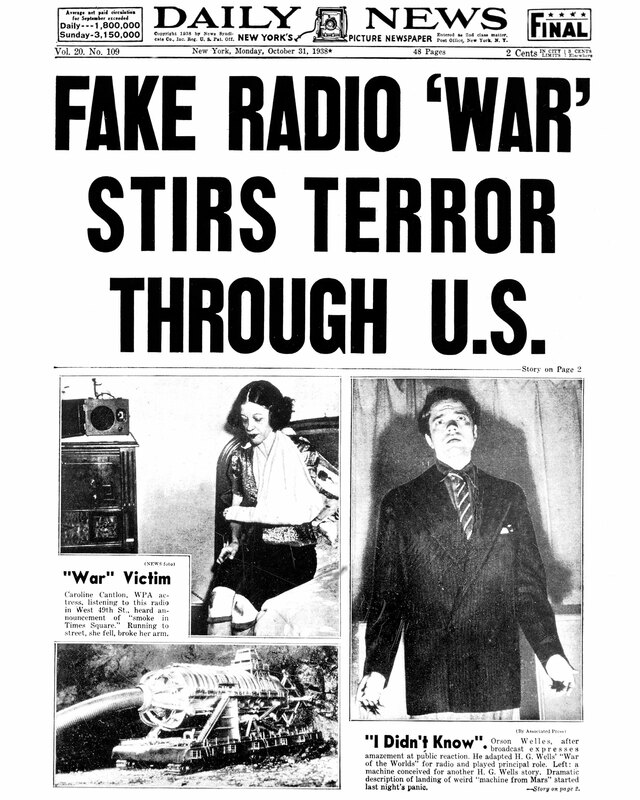 Welles’ twist for The War of the Worlds was to use radio conventions to convey the confusion and terror of the original story. He had the cast listen to WLS radio reporter Herbert Morrison’s real-time description of the Hindenburg disaster, still famous today for its “Oh the humanity!” anguish, to get that genuine feeling of a newsman’s increasing horror as tragedy unfolds before him. Cast member Frank Readick played that role to perfection. The Halloween headlines condemned Orson Welles as a hoaxster and instigator of widespread panic. It was enough to scare CBS into calling a hasty press conference at which Welles expressed his deep regret, insisting he had no idea anybody would take it seriously. He may or may not have been genuinely contrite (his expression around the 5:35 mark reminds me of Puss in Boots’ big-eyed hat-in-hand look from Shrek), but the story vaulted him to national fame, secured a sponsor (Campbell’s Soup) and another two years of the radio show. It’s also the reason RKO Studios gave Orson Welles an unprecedented two-movie contract granting him complete artistic control of his pictures. Without The War of the Worlds, there would have been no Citizen Kane. The broadcast still holds up, even though reporters don’t talk like that anymore. The sound effects — especially the panicked crowd noises — are great and the adaptation remains one of exceptional dexterity and verve. Listen for yourself and see what you think. Would have spent all your shoe money on a ticket out of town if you had heard this 77 years ago? Robert Hemming Poulsen lays fiber-optic cable for a living. For fun, he takes his metal detector with him on assignments and explores new places in his downtime. 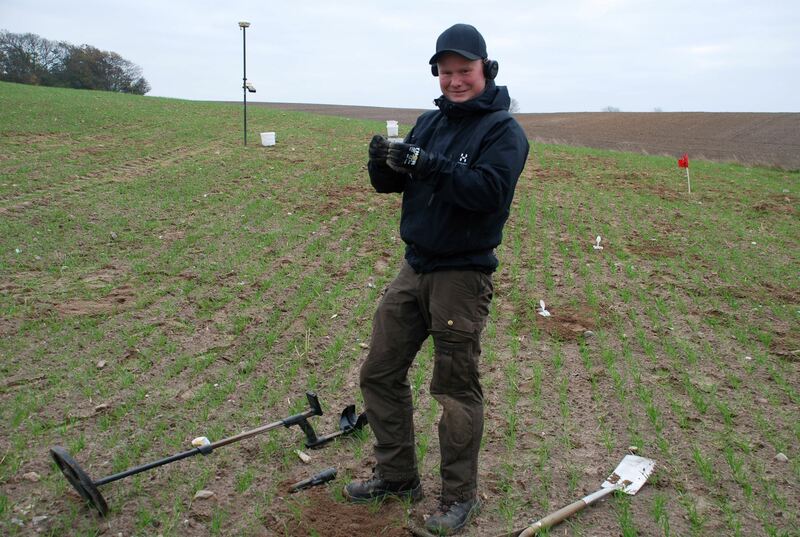 Last month Poulsen was installing a fiber-optic network on the Danish island of Omø when he struck up conversation with farmer Hans Peder Tofte. Tofte told him that as a boy he had found a silver ring on his property. 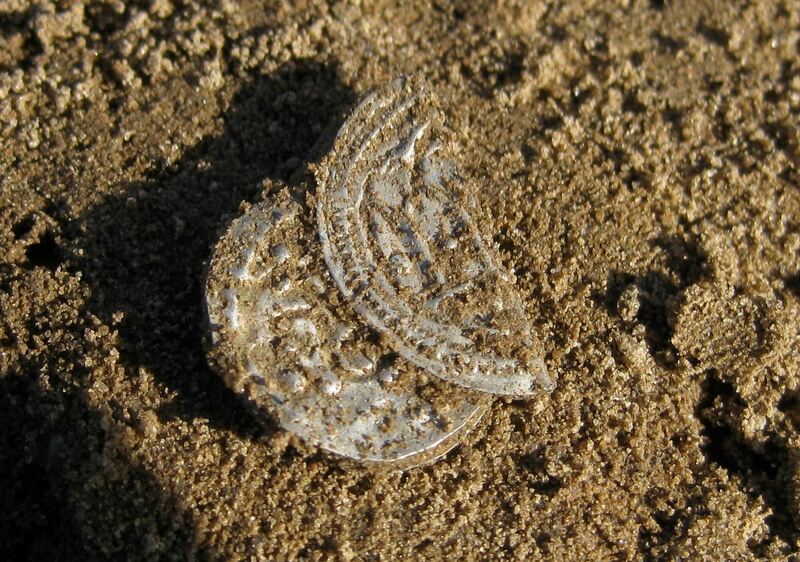 Intrigued, Robert took his metal detector to the field and discovered several silver fragments and silver coins. An experienced and responsible amateur, Poulsen stopped the search and alerted the Zealand Museum to his finds. With funding from the Danish Agency for Culture, the museum arranged for a more thorough exploration of the field. Last weekend museum experts joined Robert Poulsen and three of his experienced metal detecting friends to search the site. They discovered more than 550 silver fragments, silver coins, cuttings from silver coins and silver jewelry from the 10th century. This was an all-silver hoard. All of the artifacts were unearthed in an area about 100 feet in diameter suggesting they were originally buried in a single hoard. The field has been ploughed for hundreds of years, however, so if there was a container, it has long since been destroyed and/or rotted away. The team dug beneath the ploughed soil just in case, but all they found was clean sand. There are no indications of an individual house or settlement in the area. It appears that the treasure was simply buried in a field. While most of the hoard is composed of fragments of hacksilver as small as .1 grams, including tiny cuttings of Arabic coins called dirham clips, it has a number of rare and important pieces. 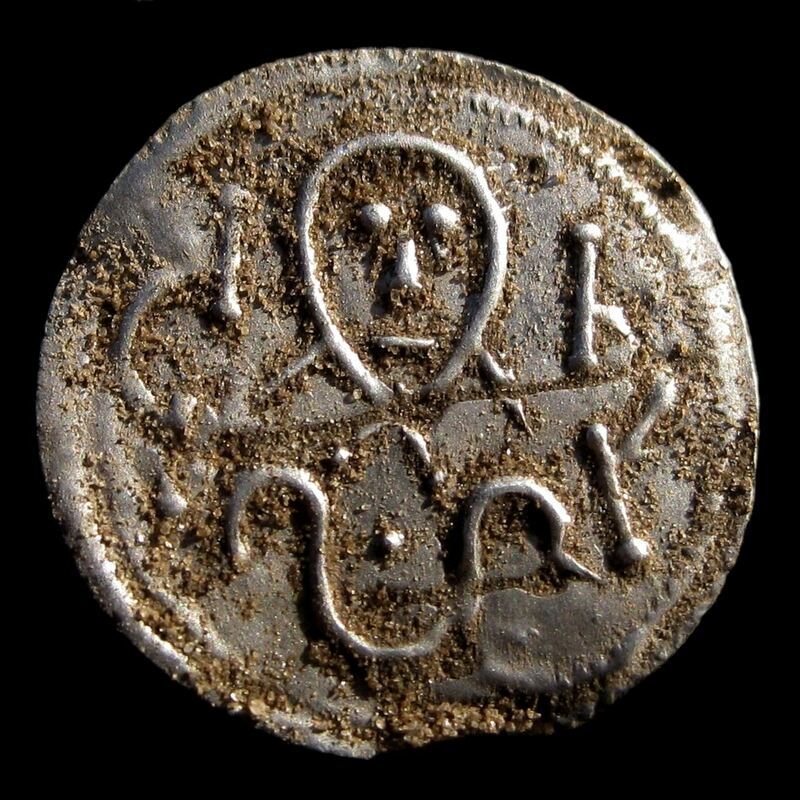 There are multiple coins from the reign of Harald Bluetooth. 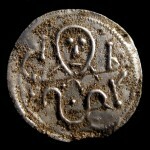 Minted between 975 and 980 A.D, the Harald Bluetooth cross-coins are considered the first Danish coins. They are so thin that the design on one side shows through on the other, and the silver content and weight are so low that metal detectors can’t detect them. Any find of Bluetooth coins, therefore, is always archaeologically significant. Besides the Arabic and Danish coins, the hoard also contains silver coins from England, Germany, Poland and the Czech Republic. Some coins have yet to be identified. Three unidentified coins were found in an unusual configuration: one coin folded over the other two. 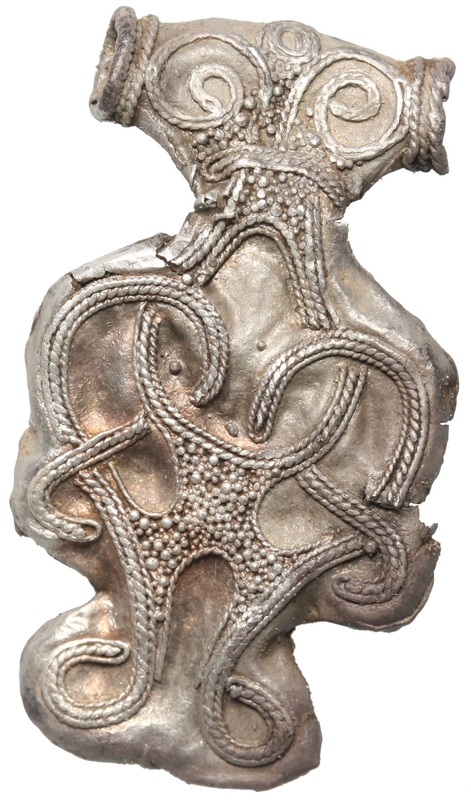 Similar pieces have been found before in England, but they’re from later in the Middle Ages and the they have one complete coin folded over a half coin thereby created a one-and-a-half denomination. All three of Omø coins in this configuration are complete. The jewelry is all in pieces. 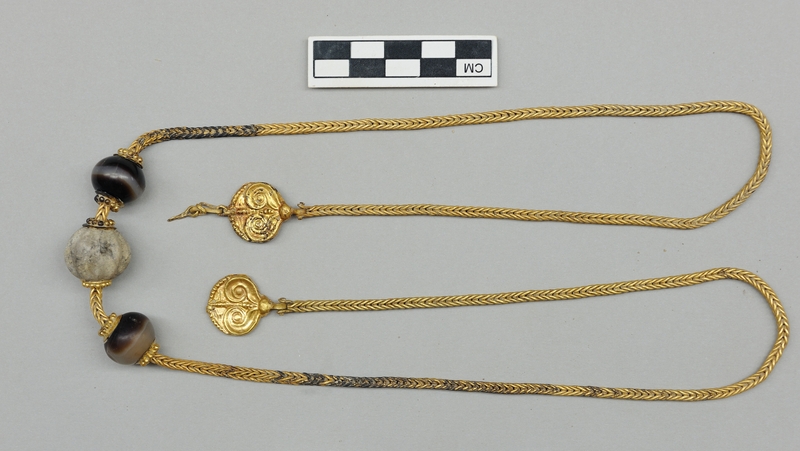 Among the fragments of bracelets, rings and pendants are two objects of particular interest: a cross and pendant that are decorated in the same style as an important hoard of jewelry discovered on the German Baltic Sea island of Hiddensee in 1873. 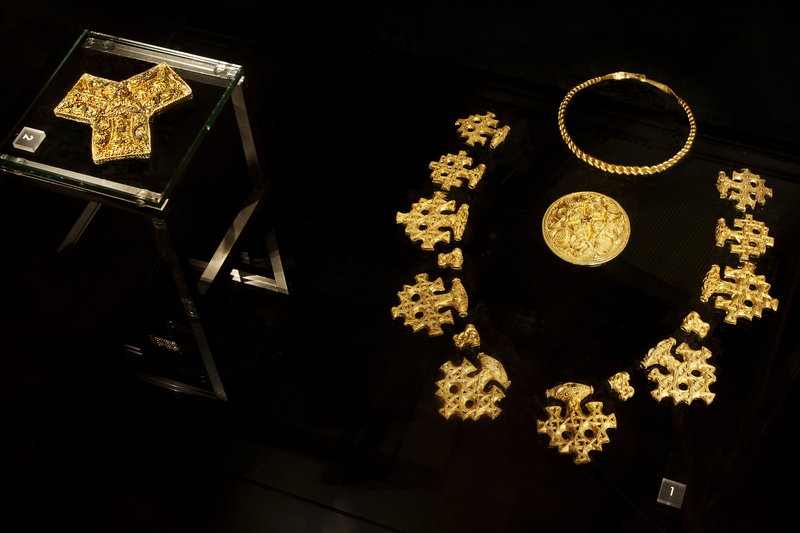 The Hiddensee treasure dates to the 10th century and is believed to have belonged to the family of Harald Bluetooth himself. The difference is the Hiddensee jewelry is all made of gold, while the pieces found on Omø are silver. That makes them unique. 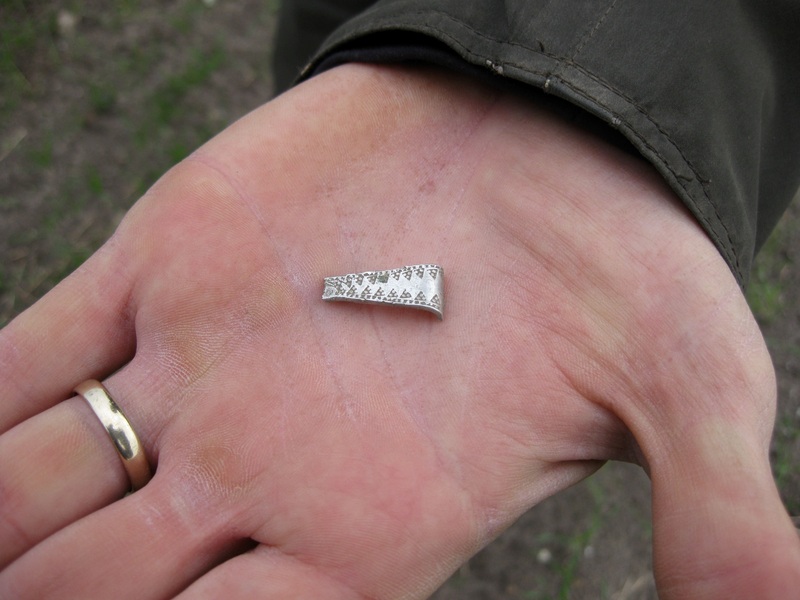 No other silver Hiddensee-type jewelry has been found before. 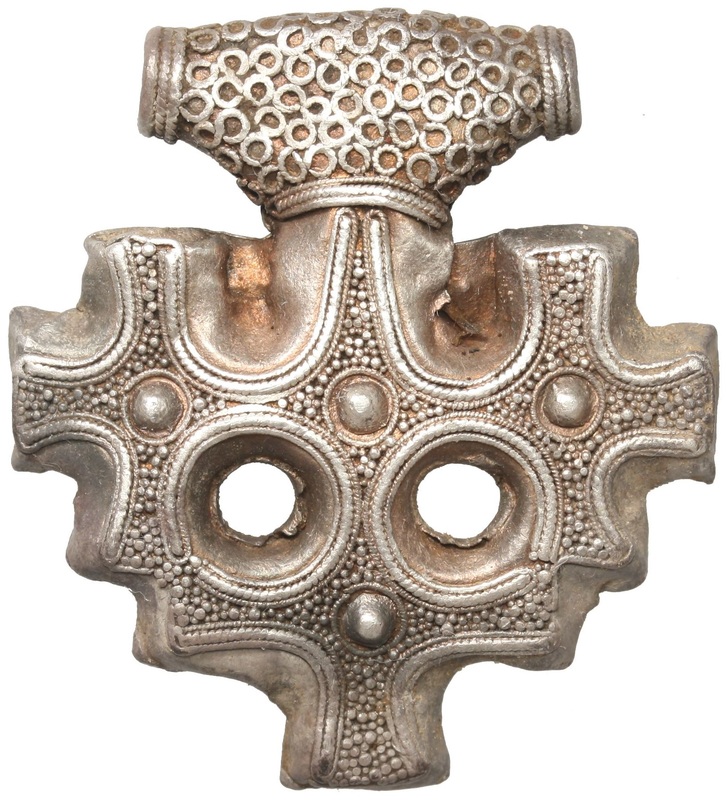 By Danish law, historical finds are treasure trove and property of the state. The Zealand Museum will thoroughly document and photograph every piece before sending them to the National Museum for valuation by experts. Finder Robert Poulsen will receive a reward based on the value of the hoard. 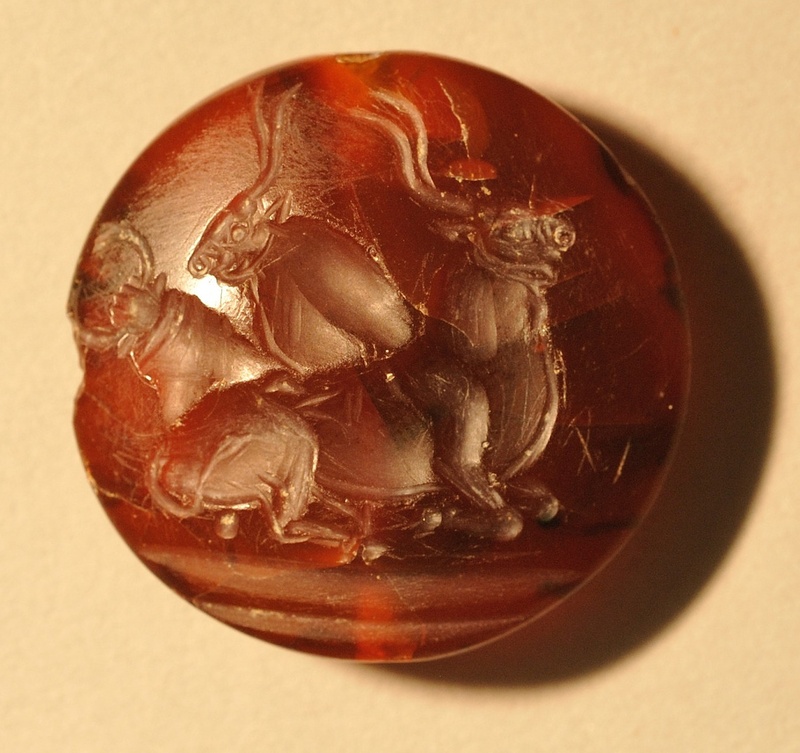 The Zealand Museum hopes they will then get the hoard back for exhibition, but that depends on whether the National Museum deems its security measures sufficient to protect the find. 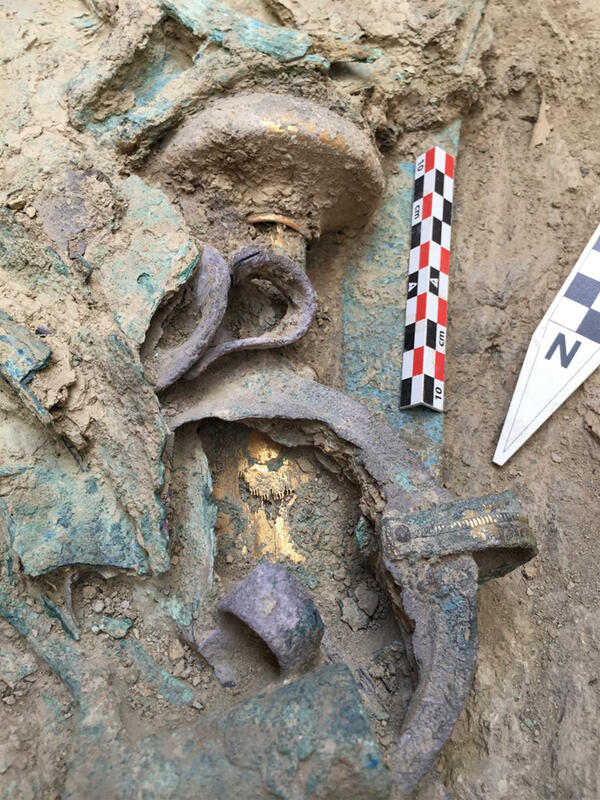 Archaeologists digging near the ancient city of Pylos in the Peloponnese region of southwestern Greece have unearthed a richly laden tomb dating to around 1,500 B.C. Led by University of Cincinnati archaeologists Jack Davis and Sharon Stocker, the international team was excavating a previously unexplored field next to the Palace of Nestor. They chose to dig in a place where three stones were visible on the ground, thinking they were the remains of a Bronze Age house. They soon realized those stones were the top of a shaft tomb. After two weeks of digging, archaeologists hit gold, figuratively, that is. Literally they hit bronze, but that was just the beginning. Inside a shaft tomb about five feet deep, four feet wide and eight feet long was the skeleton of an adult male and an eye-popping collection of grave goods. To the left of his chest was a sword three feet long with an ivory hilt overlaid with gold. Underneath the sword was a dagger with a gold hilt in the same embroidery-like technique found on the long sword. To his right were jewels, among them a hoard of more than 1,000 beads of carnelian, amethyst, gold, agate, jasper and gold, most of them drilled through so they could be strung together. Small fragments of a cross-woven textile suggests some of the beads decorated a burial shroud. 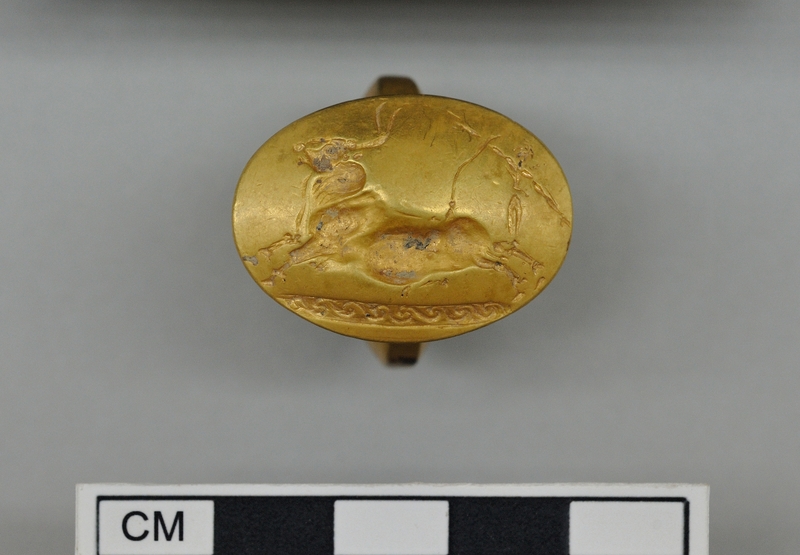 Near the beads were four solid gold rings, the most that have ever been discovered in a single burial in Greece, plus six silver cups and an assortment of bronze vessels, some with gold or silver trim. On his chest were two squashed gold cups and a silver cup with a gold rim. By his neck was a unique gold necklace 30-inches long with a box weave chain and finials in a sacral ivy pattern. At his legs and feet were more bronze weapons, including a sword and spearhead, and thin bronze strips likely to be the remains of a suit of armor on top of his body. (Many of the grave goods were placed on top of his coffin when he was buried. When the wood of the coffin decayed, those goods settled on and around the warrior. Other assorted finds include: a bronze mirror with an ivory handle, more than 50 seal stones intricately carved with Minoan designs of deities, lions, bulls and bull dancers vaulting over the animal’s horns, carved ivory pieces including a griffon and a lion attacking a griffon and six ivory combs. 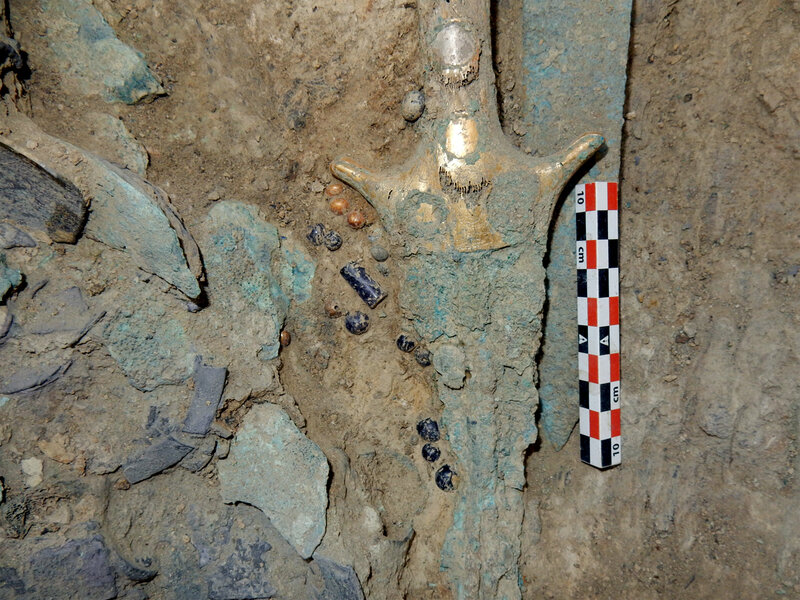 Before this find, graves this rich were only found in the archaeological site of Mycenae, one of the great military centers of early Greece after which the period (1600 – 1100 B.C.) of its dominance is named. Pylos was thought to be a bit of a backwater compared to the grand city of 30,000, but the ultra-rich graves of Mycenae were multiple burials. 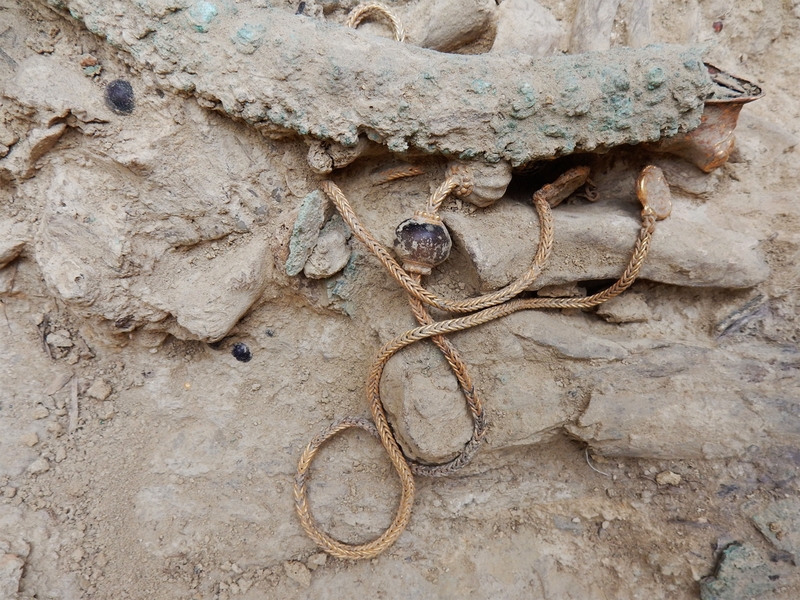 The discovery of the wealthiest single burial in ever found in Greece in Pylos means historians may have to revise their understanding of the town’s ancient importance. Another archaeological boon from this discovery is that we know all the grave goods belong to this one man. The multiple burials made it difficult for archaeologists to identify which artifacts belonged to which person. One hypothesis was that the grave goods could be divided by gender — men get the weapons, women get the combs and beads — but this discovery shows that a gender division doesn’t work because the man was buried with every kind of artifact under the sun. There was no name or identifying information in the grave, but the burial is older than the palace of Nestor which was destroyed in 1,180 B.C., so these are not the remains of a Homeric hero. Thus, the tomb may have held a powerful warrior or king — or even a trader or a raider — who died at about 30 to 35 years of age but who helped to lay the foundations of the Mycenaean culture that later flourished in the region. The more than 1,400 artifacts recovered from the grave are now at the Archaeological Museum of Chora where they will be conserved and analyzed. 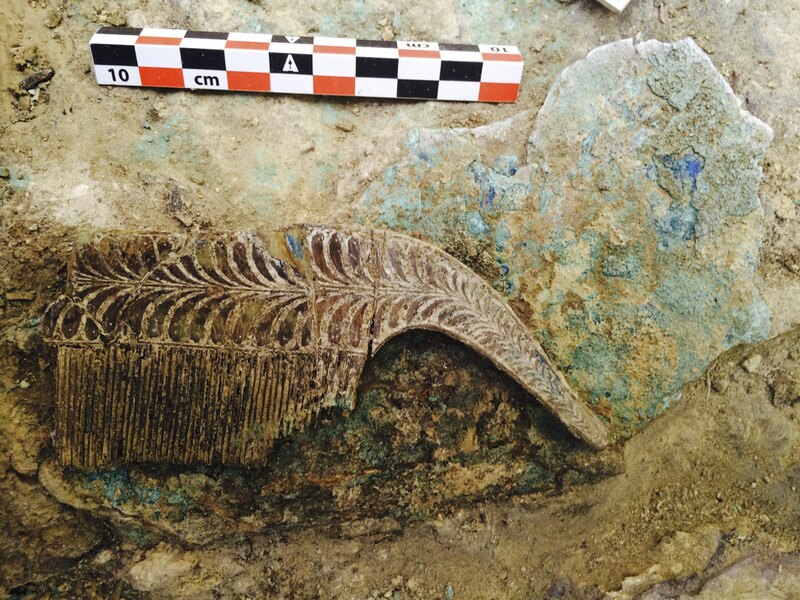 Because so many of the pieces seem to have originated in Minoan Crete, archaeologists are hoping the study of the grave goods will give them a new understanding of the trade networks connecting ancient Crete and Mycenaean Greece. In 1931, star of stage and screen John Barrymore sailed to Alaska aboard his new 120-foot yacht the Infanta. His purpose was to hunt Kodiak bear, but he took a different kind of trophy when he visited the village of Tuxecan on Prince of Wales Island in southeastern Alaska: a totem pole 25 feet high. Barrymore had the pole sawn down leaving just a stump behind, then had it sawn into three sections to make it easier to carry on the deck of his yacht. 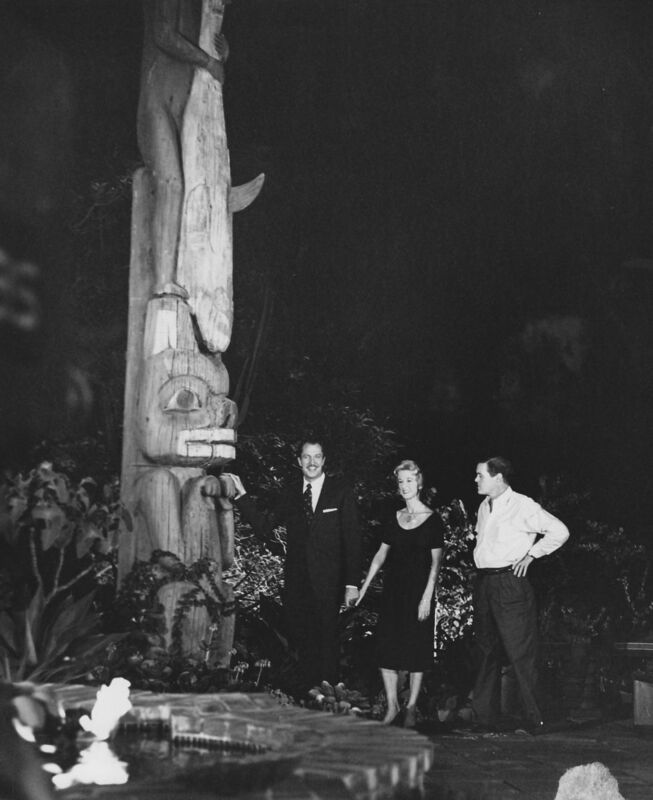 Once home, the actor installed the totem pole on the grounds of his Beverly Hills estate, Bella Vista. Tuxecan had been abandoned 30 years earlier when a clan leader convinced the Tlingit tribe members who lived there to move south to the town of Klawock where there was a new school and the state’s first cannery. They left behind a forest of totem poles which the villagers occasionally returned to tend to, but over time began to tip over and decay, a process that the Tlingit held to be part of the natural lifecycle of kooteeyaa (totem poles). Tlingit totem poles were carved from single trunks of Western red cedar and raised outside people’s homes. The animals from a clan’s crest were carved on the poles, but each one had a different combination of figures and a different meaning. They celebrated family history, could commemorate a person or event or broadcast a wrong done to the pole’s owner. Some were funerary monuments that included the ashes of the dead in bentwood boxes placed in niches in the back the pole. While the were not objects of religious veneration per se, they were and are held to be sacred. The higher the pole, the more prestigious it was. The highest poles in Tuxecan reached 30 feet or so, which means the 25-footer Barrymore stole was a very important piece in its day. Its importance has only increased with the passage of time and the loss of almost all of the more than 100 totem poles that once graced Tuxecan. Only two other original totem poles survived, moved to Klawock along with the tribe at the turn of the last century. The totem pole makes an ominous appearance in Gene Fowler’s biography of John Barrymore, Good Night, Sweet Prince. 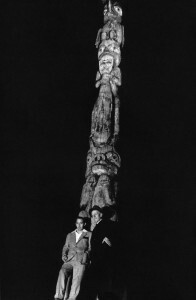 Barrymore was warned that removing the totem pole would bring him back luck, and Barrymore, who had an interest in diverse religious traditions, was somewhat concerned that the tribal gods “might take a notion into their whimsical noggins to wreak vengeance on the thief.” If they did, they used his preexisting alcohol addiction to get to him. John Barrymore died of cirrhosis of the liver in 1942. Price donated the totem pole to the Honolulu Museum of Art in 1981. The museum didn’t have space to exhibit the entire pole, so the top third was on display in the museum’s Kinau Courtyard while the rest was kept in climate-controlled storage. The top third joined its two brothers in storage 12 years ago when it was taken down during a renovation. 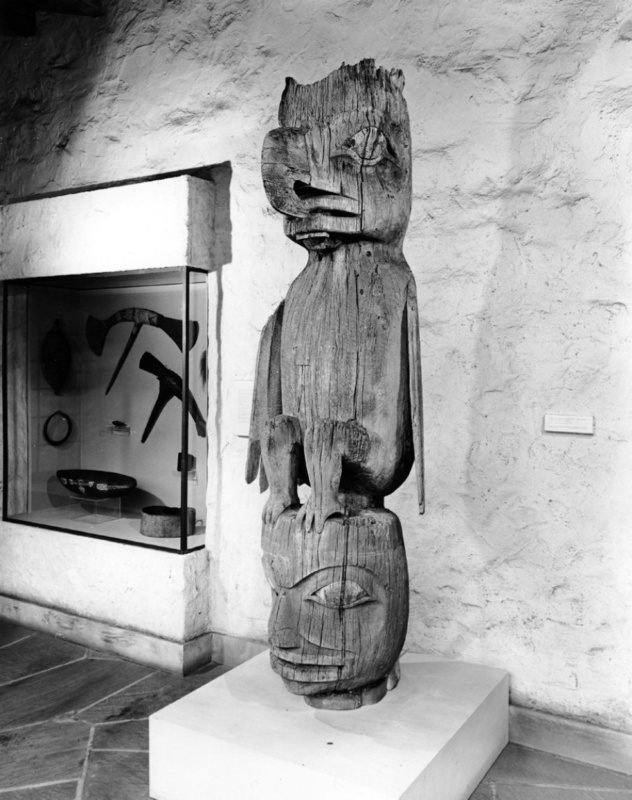 Meanwhile, University of Alaska Anchorage anthropology professor and Tlingit expert Steve Langdon stumbled on the totem pole in the 1990s while researching the Tlingit villages of Prince of Wales Island in a Ketchikan museum. 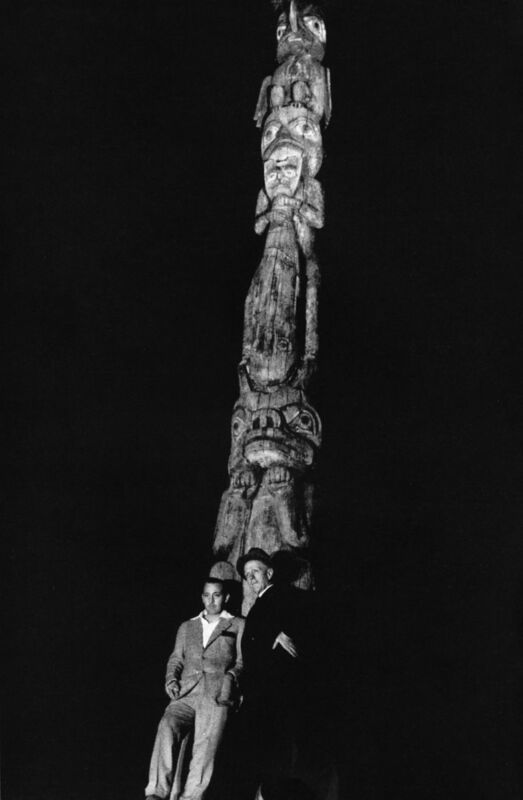 He was looking through some old photographs when he came across a snapshot of Vincent Price standing in front of the totem pole. The cactuses indicated that this picture had not been taken in Alaska. Langdon consulted with Jonathan Rowan, a carver and cultural educator from Klawock, who helped him identify the pole in photographs of Tuxecan from the late 19th century. 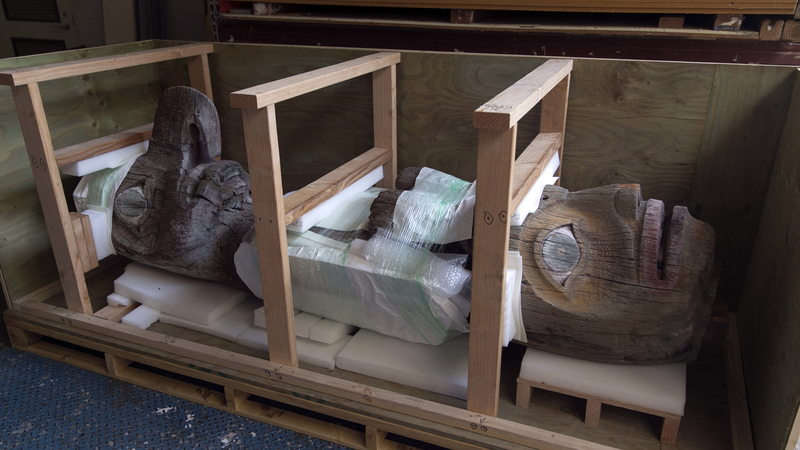 Langdon, with the blessing of Tlingit leaders, visited the Honolulu Museum of Art in 2013 with his evidence in tow. Museum director Stephan Jost recognized that Langdon had the goods. A formal investigation by the museum determined that the totem pole was indeed an object of cultural patrimony and the official repatriation process began in January of this year. 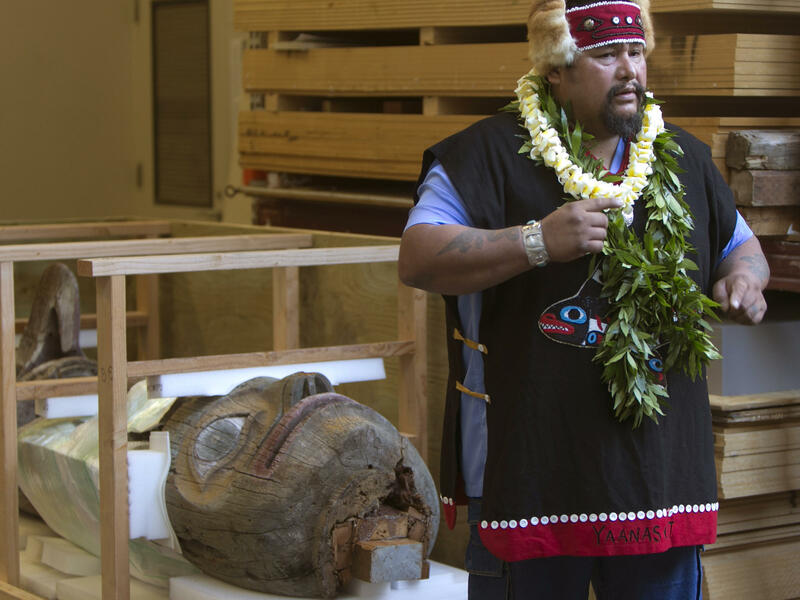 On Thursday, October 22nd, the kooteeyaa was formally returned to Tlingit tribal members including Jonathan Rowan and his daughter Eva in a ceremony at the Honolulu museum. This week it sails for Alaska. Once home, the totem pole will be studied by Rowan and other experts in an attempt to identify which clan it originally belonged to and whether it was a mortuary monument. Altman told Price that it was, that the yacht crew members who cut it down “threw Mom and Dad in the creek” before sawing it in three. It will be difficult to determine whether it was a funerary piece because at some point during its California sojourn the back was back dug out to insert a pair of metal stabilizing rods and Barrymore had converted it into a fountain. Correcting Price’s understanding of the animals and identifying the crest is less daunting. Rowan believes from the photographs that the “bear-like creature” at the bottom may be a wolf, the “gigantic fish” is almost certainly a killer whale and the bird up top is an eagle. If you’d like to learn more about the totem pole saga, Steve Langdon’s lecture at the University of Alaska Anchorage last year is on YouTube in two parts. Anybody who thought that appeal of the witch trial was a waste of state resources better get their Valium dispensers locked and loaded. At a press conference on Wednesday, October 21st, a committee of politicians and scientists announced they’ll be searching for the legendary treasure-filled tomb of Alaric I, king of the Visigoths, under a river flowing through Cosenza, a city in the region of Calabria near the toe of Italy’s boot. “It’s a real-life Indiana Jones hunt,” said Francesco Sisci, the project coordinator. “You have a legend of long-lost treasure, even the Nazis – Heinrich Himmler came here in 1937 to try to find the hoard for Hitler. He stayed in a Swabian castle. This is the stuff of Hollywood and Steven Spielberg. “If there really is 25 tons of gold, it would be worth around one billion euros at today’s prices,” he said. When the project coordinator invokes Indiana Jones, you know it’s legit. This scheme is the brain child of a committee formed last year by the municipality of Cosenza to develop new cultural and touristic events around the legend of Alaric. The tomb doesn’t actually have to be found, therefore, in order for the search to fulfill its ultimate goal of promoting Consenza’s greatest claim to fame. Which is a good thing, because the odds of finding said tomb are so miniscule they make the Richard III parking lot excavation look like a sure shot. Alaric, once a leader of a band of Gothic foederati (irregular troops who fought with the Roman army) under Emperor Theodosius I, has gone down in history as the first invader to sack Rome in 800 years, since the Gaul Brennus in 387 B.C. Rome wasn’t actually the capital anymore when Alaric took it in 410 A.D., however. It hadn’t been since 286 when Diocletian made Mediolanum (modern-day Milan) the capital of the Western Empire. Alaric besieged Mediolanum during his first invasion of Italy in 401, spurring the young and feckless Western Roman emperor Honorius to move the capital to Ravenna in 402 because it was surrounded by marshes, well-fortified and had direct access to the Adriatic, ideal should a hasty escape become necessary. His personal safety was his only interest. The new capital was horribly situated to protect Italy from barbarian invaders. It was only through the efforts of Flavius Stilicho, Honorius’ top general and former regent during the emperor’s minority, that Alaric’s army was kept at bay on multiple occasions from 401 until 408 when Honorius had Stilicho arrested and executed, ostensibly for conspiring to overthrow him. 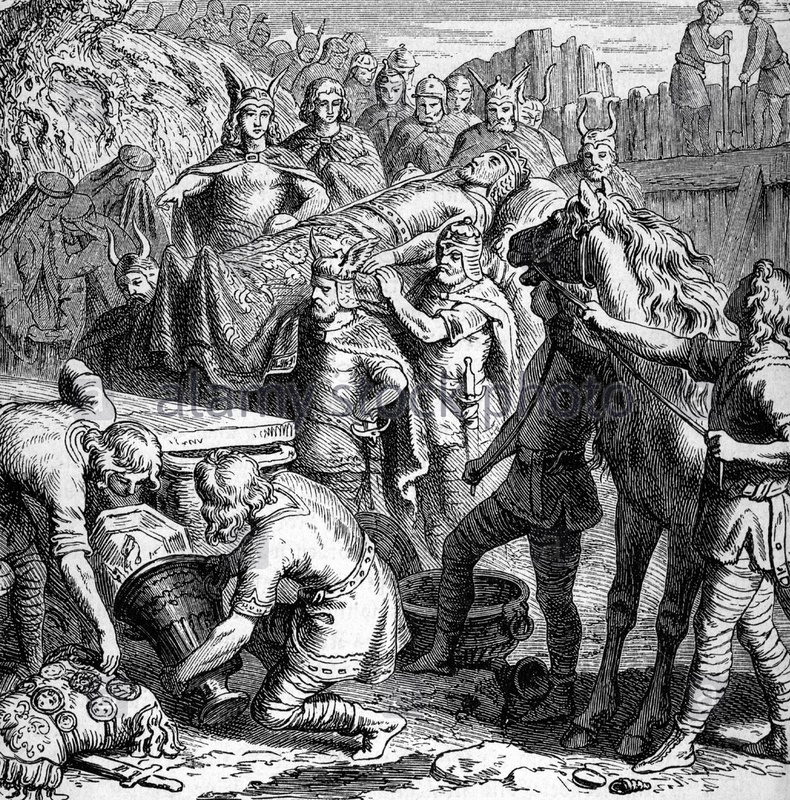 In the first decade of the 5th century, Alaric besieged Rome three times, but he wasn’t just in it for the pillage and loot. He wanted the emperor to appoint him commander-in-chief of the Imperial Army and grant him huge tracts of land in Pannonia. Putting pressure on Rome, which while no longer the capital was still seat of the Senate and the symbolic center of the empire, was a means to those ends. The first siege after Stilicho’s death in late 408, ended with a massive payoff. According to Zosimus’ New History, the Senate gave Alaric 5,000 pounds of gold, 30,000 pounds of silver, 4,000 silk robes, 3,000 fleeces dyed scarlet in exchange for him lifting the siege. One year later Alaric’s forces besieged Rome again after the failure of negotiations with Honorius. This time only the proclamation of a new emperor would do to get Alaric to lift the siege, and so Priscus Attalus was installed as puppet. While Attalus and Alaric had some military successes in Italy, enough to scare Honorius into preparing a flight to Constantinople, they soon hit the wall and Alaric dumped his puppet less than a year after installing him. He tried negotiating with Honorius again, but gave up for good after a sneak attack from Honorius’ Goth ally Sarus when Alaric was waiting to meet the emperor at the appointed time. On August 24th, 410 A.D., the Visigoths reached the Salarian Gate of Rome. This time there was no siege. Alaric’s army spent three days sacking Rome, but it was quite respectful, as sacks go. They didn’t set it on fire — only a few public buildings were burned down for strategic reasons — and they spared the churches of Saint Peter and Paul. They didn’t indiscriminately kill people either, although they enslaved thousands. His people mourned for him with the utmost affection. Then turning from its course the river Busentus near the city of Consentia — for this stream flows with its wholesome waters from the foot of a mountain near that city — they led a band of captives into the midst of its bed to dig out a place for his grave. In the depths of this pit they buried Alaric, together with many treasures, and then turned the waters back into their channel. And that none might ever know the place, they put to death all the diggers. So. That is what the Cosenza search is up against: a tomb rumored to have been dug underneath a river in a location known only to slaves killed before they could share that knowledge. Past attempts to find the fabled treasure have all involved digging along the riverbank, a blind, clumsy approach that this new effort will eschew in favor of the latest technology. 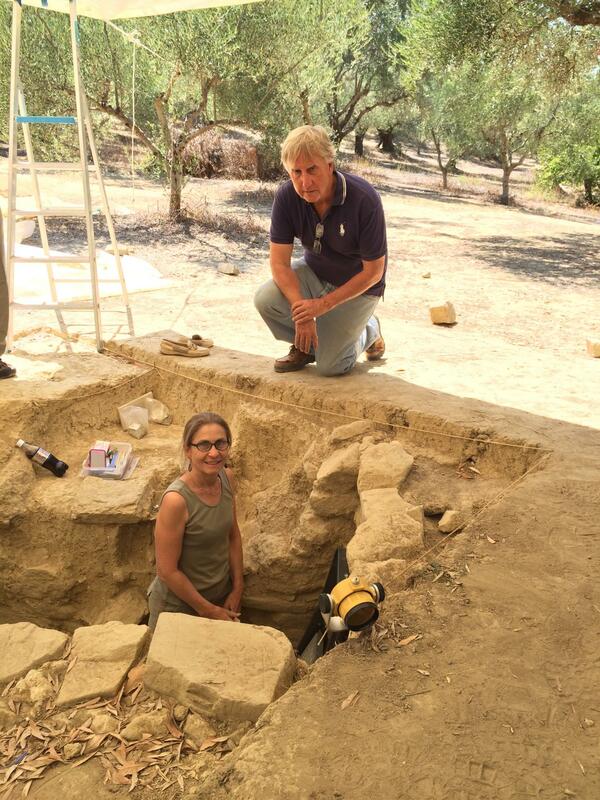 The latest technology will be used to search for rectangle-shaped “anomalies” underground in the hunt for the fabled tomb of Alaric, said Amerigo Giuseppe Rota, the geologist leading the project. “We think Alaric was buried at least five to six metres underground. But in the last 1,500 years the river bed has risen by about 1.5 metres, so his tomb could be up to eight metres below ground now,” he said. Sure, why not? It could be. It could also not exist at all. The whole diverted river story could be a legend written 140 years after the events it purports to describe. 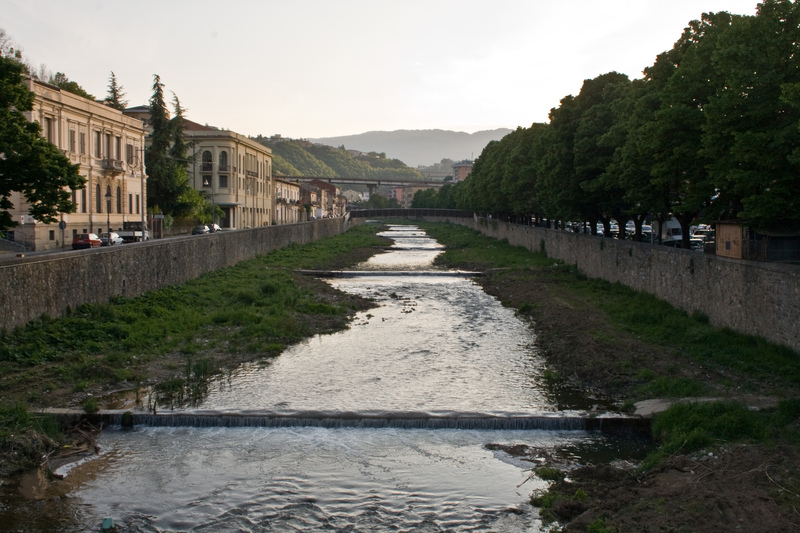 The idea that there are 25 tons of gold under the Busento River is fanciful at best. The Visigoths would not have buried all of their Roman loot with Alaric. Even if the sources are correct that he was buried with his horse and treasure according to pagan custom (Alaric was an Arian Christian, but he held to some of his people’s traditional religious practices as well), they would have been grave goods, not tons and tons of gold. Anyway the caper isn’t expected to cost much. The early geophysical surveys were funded by private donors and while there’s talk of the government in Rome chipping in, public funding isn’t likely to materialize anytime soon. 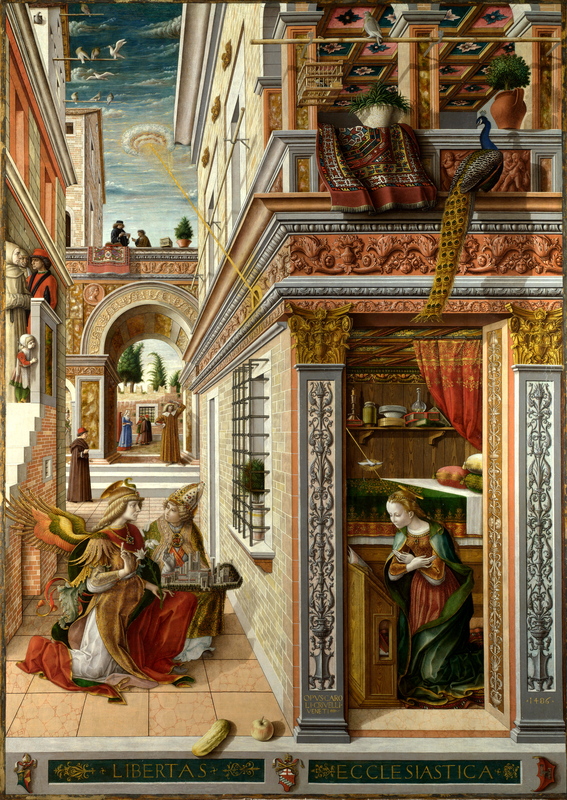 The Isabella Stewart Gardner Museum in Boston has opened the first monographic exhibition in the United States of the works of Carlo Crivelli, a Venetian artist of the 15th century whose genius has been unjustly neglected, overshadowed by his more famous (and more Florentine) contemporaries. Born in Venice to a family of painters in around 1430-35, Carlo Crivelli’s first appears in the historical record in 1457, and he was already an independent master by then and therefore at least 25 years old. The record in question documents the scandal that drove Carlo out of Venice. On March 7th, 1457, the prosecutor asked the Council of Forty, the Republic of Venice’s version of the Supreme Court, to pass sentence on Carlo Crivelli for adultery. Apparently he was having an affair with Tarsia, wife of a sailor named Francesco Cortese. He had spirited her away from Francesco’s brother’s house and for months had “carnal knowledge of her in contempt of God and holy matrimony.” Carlo was sentenced to six months in prison and a fine of 200 lire. That was actually a relatively light sentence for the time. After he served his time, Carlo went to Padua where he worked in Francesco Squarcione’s studio. Squarcione was the first artist to market himself as a teacher of the new Renaissance style, imparting lessons in linear perspective and assiduously collecting antiquities to give his students classical models to copy. Andrea Mantegna had apprenticed under Squarcione in the 1440s, and the master’s obsession with Roman antiquity was thoroughly inculcated into the pupil. Mantegna and Crivelli share an intense attention to architectural detail, the use of forced perspective and a bold, black outline that gives forms a chiseled sharpness. Crivelli may even have studied under Mantegna briefly. Crivelli spent a few years in Dalmatia with Giorgio Schiavone, aka Juraj Ćulinović, who he likely met in Padua through Squarcione. By 1468, he was in Le Marche, a region of central Italy on the Adriatic coast, where he would remain until his death in around 1494. Most of his surviving works and all of the ones he explicitly dated were painted during his years in Le Marche. He received prestigious commissions for religious works, primarily altarpieces, the largest and most elaborate of which were the monumental high altarpieces for the cathedrals of Ascoli Piceno and Camerino. 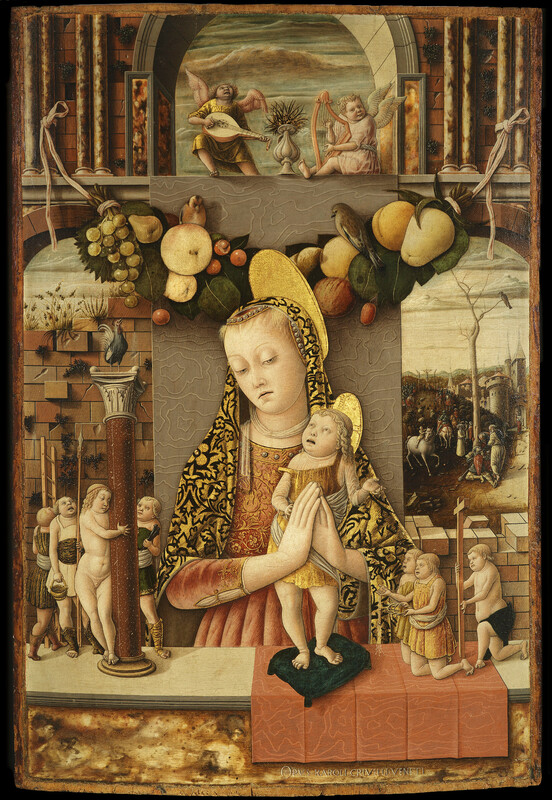 The pieces on display at the Gardner were on the main not composed as individual works but rather as sections of altarpieces that at some point were sawn apart and sold separately to collections and museums in Europe and the United States. Isabella Stewart Gardner brought the first Crivelli painting to the United States when she bought Saint George Slaying the Dragon in 1897. At a time when leading painters in Florence were espousing naturalism, Crivelli embraced the elongated figures, rich colors and ornate gold backgrounds of the International Gothic style of the century before his. To that he added a detailed realism, painstakingly rendering every textile, brick and hair to a degree unmatched by any one of his Italian peers. To create the illusion of depth, dimension and texture, he took trompe l’oeil to new heights by creating gemstones, the ornamental features of armor, brocades and silks, even tears, in gesso, and then covering them with paint and gold leaf. He added more decorative details to gilded areas with a punch or stylus, given them palpable texture. He combined still life with the garlands of ancient sarcophaguses and created a swag of ripe, luscious, oversized fruits or placed individual pieces — his signature cucumber crops up practically everywhere — in panel after panel. It’s like the Byzantine icon and Northern European realism and Italian Renaissance illusionism had a beautiful baby. Its manner is severe, hard, quaint, and even fantastic. It is remarkable for elaboration of detail. And as a further characteristic of the school, or rather of the individual master, should be observed the introduction of gold not only in the background, but extending even to the gilding of the dress and the illumination of the hair. Making allowance for the period when painted, this is truly a glorious work ; but to revive this obsolete style, as attempted in Germany and England, except, perhaps, for strict architectural decoration, were certainly a monstrous mistake, of which we imagine our artists are by this time thoroughly convinced. 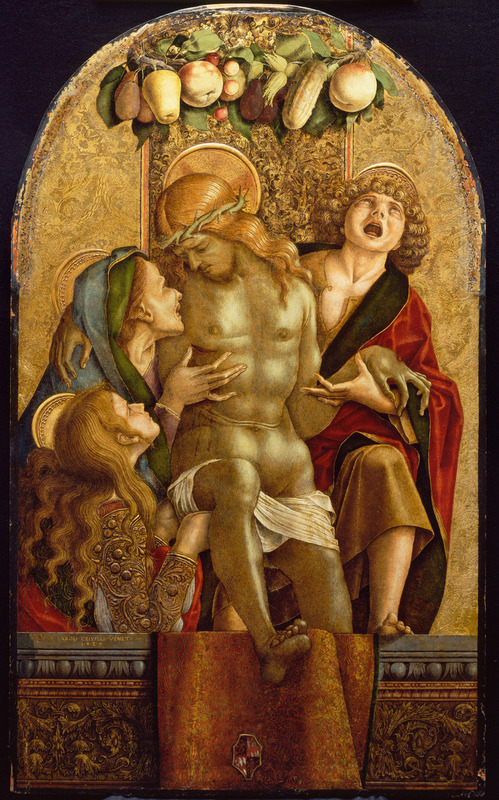 Even today when such judgments on ideal artistic progression are as passé as the above author held Crivelli’s work to be, he still flies under the radar, which is why it has taken until now for a US museum to dedicate a whole show just to him. 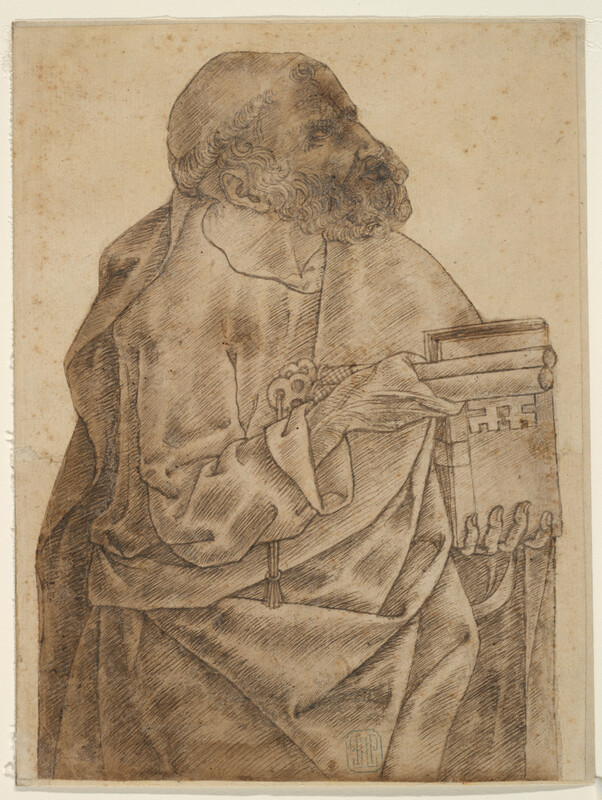 Loans from major museums in Europe and the United States have allowed the Gardner to bring together 23 of his paintings and the only drawing known to have survived. 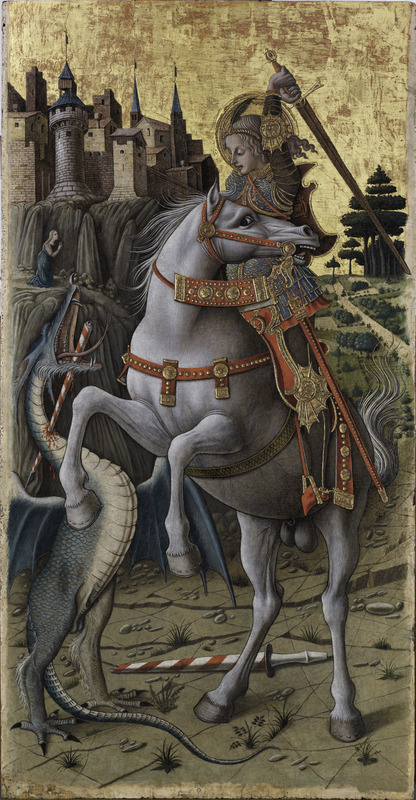 Four of the six panels from the Porto San Giorgio altarpiece, one of which is the Gardner’s Saint George, have been reunited in the show. 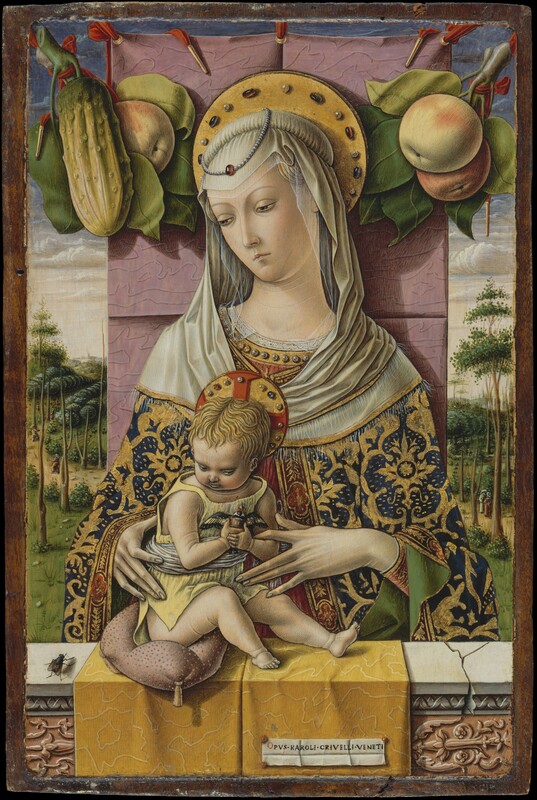 Ornament and Illusion: Carlo Crivelli of Venice runs through January 26th, 2016. To find out more about the artist, you must visit the Gardner’s excellent website dedicated to the exhibition and Crivelli’s work. There is video and audio about the conservation of Saint George, a slider showing those bold, black lines in the underdrawing, a digital reassembling of the altarpiece of Porto San Giorgio, detailed views of those amazing 3D textures he achieved with gesso and much more. A hiker in Norway has discovered a 1,200-year-old Viking sword in such good condition that with a vigorous oiling, a little time on a whetstone and a new grip it could still be used today. Gøran Olsen was hiking an ancient trail in Haukeli, south central Norway, when he sat down to take a break and caught a glimpse of the sword under a pile of rocks. The single-edged blade is 77 centimeters (30 inches) long and made of wrought iron. It is of a type that was common around 750-800 A.D. The trail where the sword was found crossed a mountain plateau between western and eastern Norway. Most of the year the pass is covered in snow and ice, and the climate during summer months when the snows have melted allowing the trail to be easily hiked is low in humidity. This combination helped maintain the condition of the sword, leaving it a bit rusty and dulled, but otherwise remarkably well-preserved. Finding an associated gravesite would be a very lucky break, but odds are long. Other artifacts have been found along the trail before. It’s possible that the sword may have been inadvertently lost by a traveler or someone who was caught in bad weather and died of frostbite. There could easily be no grave to be found. 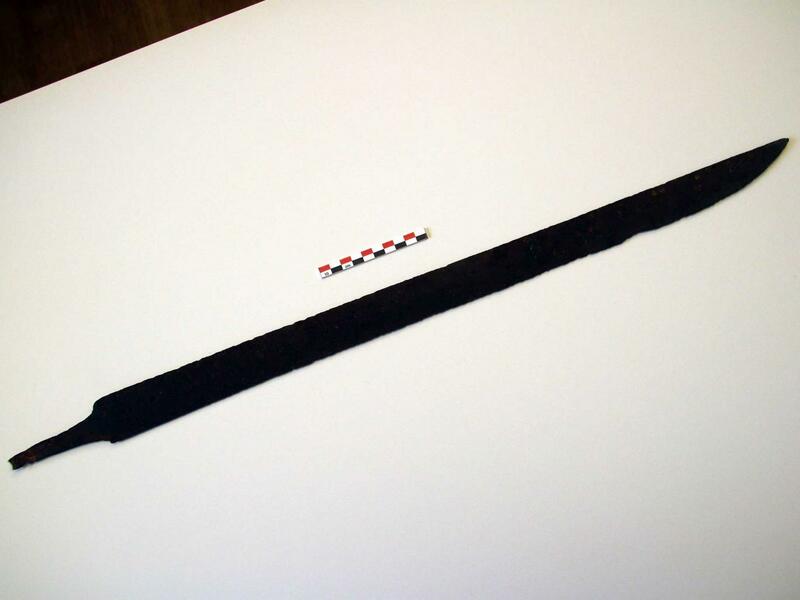 The blade has been sent to the University Museum of Bergen, Norway, for conservation and eventual display. 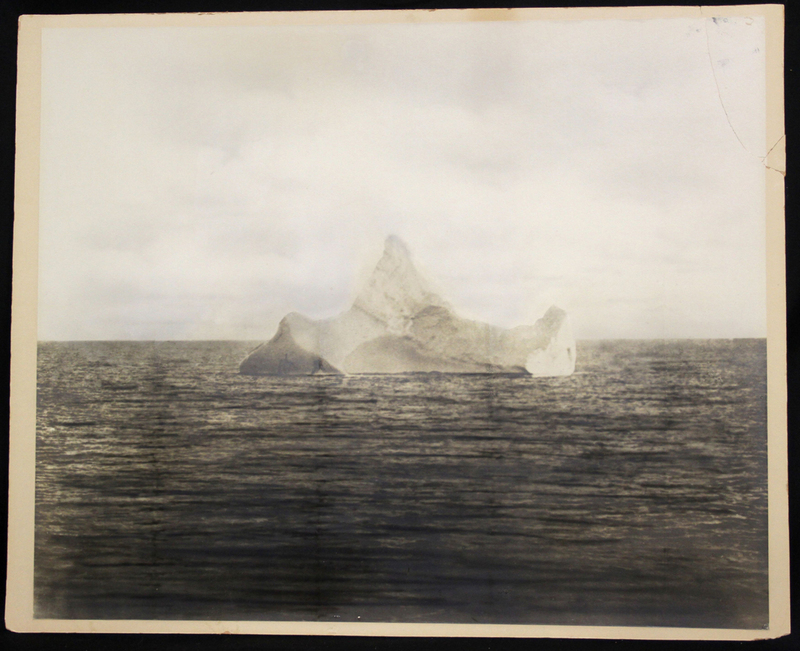 A photograph of an iceberg that may be the one that sank the Titanic is going up for auction on Saturday, October 24th. The picture was taken the morning of April 15th, 1912, by M. Linoenewald, Chief Steward of the German liner Prinz Adalbert a few miles south of where the Titanic had gone down taking 1,517 souls with her just hours earlier. The news of the disaster hadn’t reached the liner yet, but the Chief Steward noticed red paint on the iceberg and took the photo out of interest. “On the day after the sinking of the Titanic, the steamer Prinz Adalbert passes the iceberg shown in this photograph. The Titanic disaster was not yet known by us. On one side red paint was plainly visible, which has the appearance of having been made by the scraping of a vessel on the iceberg. SS Prinz Adalbert Hamburg America Line”. 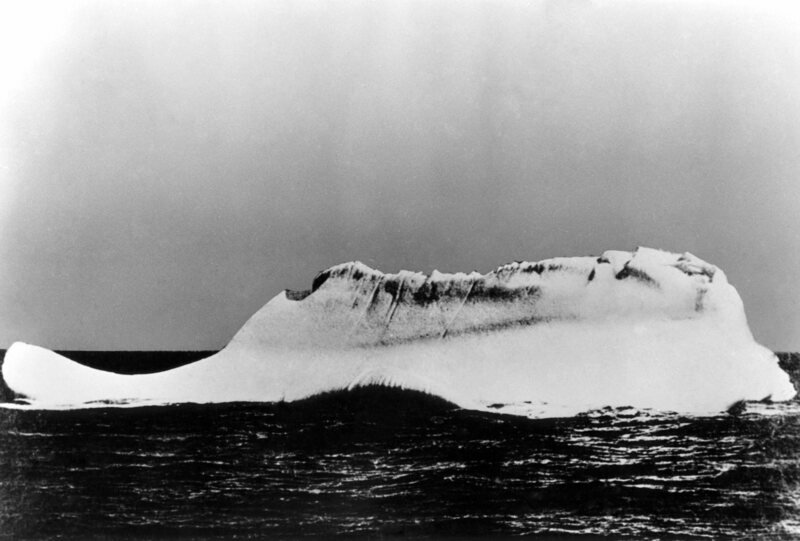 This isn’t the only picture of an iceberg suspect taken in the aftermath of the Titanic‘s demise. Captain William De Carteret of the Minia captured another possible candidate while searching for bodies. The Minia was a cable ship owned by Western Union which normally laid submarine cable for telegraph and was the second of four ships chartered by White Star as recovery vessels after the disaster. It reached the North Atlantic wreck site on April 26th, four days after the first recovery ship, the Mackay-Bennett, and searched through May 3rd. 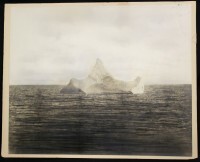 Captain De Carteret took the photograph of the iceberg with a red gash along the base. According to him and the ship’s logs, that was the only iceberg encountered near the site of the collision. The Reverend Henry Ward Cunningham, on the other hand, told the press he had seen two icebergs and that the officers told him they’d seen more in the distance. The Minia searched a wide area, however, so the Captain likely snapped a photograph of the only iceberg he’d seen that was where the ship actually went down rather than the many miles over which the bodies floated, drawn towards the warm waters of the Gulf Stream. 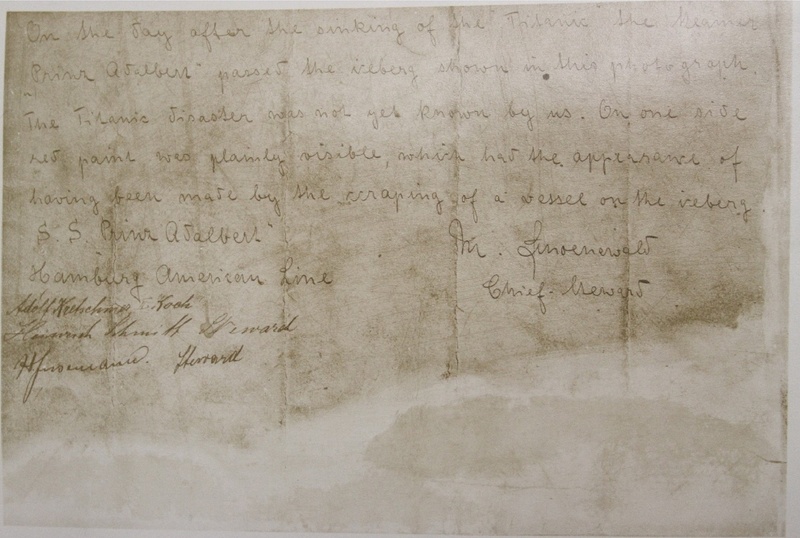 The crew of the Minia recovered 17 bodies from the wreck site, among them Charles Melville Hays, President of the Grand Trunk Railway, but most of the deceased had no identification. The bodies were found miles apart, the last two recovered 45 miles away from each other. All were wearing life belts and according to the ship’s doctor, only one of them had water in the lungs indicating drowning. Fourteen died from exposure, two apparently from trauma during the wreck. The bodies of two unidentified firemen were buried at sea in a solemn ceremony. The other 15 were brought to Halifax. The photograph taken by the Chief Steward of the Prinz Adalbert doesn’t match the survivors’ description of the iceberg as well as De Carteret’s does, but the descriptions are vague and contradictory. It’s of historical significance either way because it was taken so soon after the disaster and because it played a role in the legal fallout. Hamburg American Lines officials gave the photograph to the company lawyer, Charles Burlingham, partner at Burlingham, Montgomery & Beecher, when they heard that the firm was representing the White Star Line. Burlingham, Montgomery & Beecher represented White Star at the US Senate hearing and in the many lawsuits brought by survivors in America. They did their job well since a 1914 US Supreme Court decision, written by Oliver Wendell Holmes, determined that the US Limitation of Liability Act of 1851 applied to the British company and that therefore their total liability was the value of whatever remained of the ship and its cargo, ie, 14 lifeboats valued at $4,520, plus $93,252 in ticket sales and freight charges. Because of the monster shitstorm of bad publicity, White Star ended up settling with the many, many US claimants — survivors suing for loss of property and trauma; family members for the loss of their loved ones — for a grand total of $664,000. Burlingham, Montgomery & Beecher kept the iceberg picture on the boardroom wall for almost 90 years, from 1913 until the firm went out of business in 2002. The four remaining lawyers who were partners of the firm when it closed are the joint owners of the photograph offering it for sale. It is estimated to sell for £10,000 to £15,000 ($15,000 – $23,000).